This terraced five bay, two storey, protected structure and rendered house c 1830 is fronting onto Main Street across from St. Mary’s RC Church. 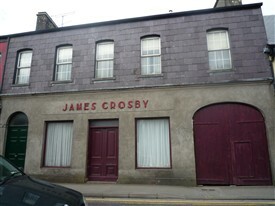 It is located within a terrace of early 19th century buildings and was the home of Mr. & Mrs. Crosby (nee Maye). They set up their drapery shop in this building probably sometime after the World War11. Both men and women were catered for. They had three sons and one daughter with all three boys becoming successful and popular priests in the west of Ireland. Fr. Ned served as a priest in a wide variety of cultures and places, including Hillside, Ballybane, Galway City, Clare Island off Co Mayo, Motupe in Lima, Peru, and Kilfenora, Co Clare. In Lima, Fr. Ned worked with street children and as a prison chaplain, where he had to minister to members of the Shining Path terrorist group. Ned is also a former chaplain of St. Joseph's College, Galway. Fr. Ned's experiences as a cleric at home and abroad has given him a very unique insight into social, political, cultural, and spiritual matters and he published four volumes of poetry as well as a book on the community of Clare Island entitled "Glimpses of Clare Island". Ned’s home town has inspired some of his poems, although the majority of them recall his experiences in Lima Peru. They present the realities of injustice, and the difficulties in seeking a fairer world. All profits from his books go towards several volunteer projects around the world. Fr. Michael Crosby, Fr. Ned’s brother is a keen golfer and was President of Ballinrobe Golf Club in 1993. He is currently Parish Priest in Glencorrib, Shrule, Co. Galway. No. 07 on the Town Heritage Trail. Note: More information would be appreciated - see add you own story.